driven by the Italian-American crew composed by Bret Curtis, Riccardo Pera and Fabio Babini. 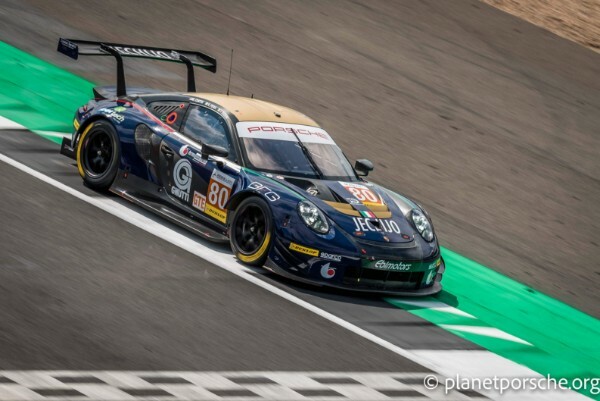 Seven cars were enrolled in the LMGTE category with the return of the Porsche No. 86 Gulf Racing. R. Pera (Ebimotors) placed his No. 80 car on the sixth class position with the time of 1’59.378; D. Olsen (Proton Competition – 1’58.704) was on the pole position. It was an unexpectedly flowing race. Very few dramatic turns of events occurred but various drive through penalties were imposed due to the abuse of the track. Our drivers had a steady performance but they remained in the second part of the group. We were also imposed a drive through during the last and unplanned pit stop. This did not allow us to pass under the chequered flag. Despite the great diligence of both our drivers and team, last weekend was unlucky. But we are ready to get even next and second to last seasonal round on the Spa-Francorchamps circuit on September, 23rd. Drivers: 1. Roda-Roda Jr 72 points; 2. Macdowall-Griffin-Molina 63; 3. Cairoli 62; 4. Scott-Cameron-Griffin 58; 5. Ried-Dienst 53; 6. Pera-Babini 46; 7. Bertolini-Jönsson-Krohn 38; 8. Olsen 35; 9. Narac 31; 10. Lieb 18; 11. Curtis 15; 12. Bruni 10; 13. Davison-Barker-Wainwright 10; 14. Castellacci-Flohr 8. Teams: 1. (88) Proton Competition 72 points; 2. (66) JMW Motorsport 63; 3. (55) Spirit of Race 58; 4. (77) Proton Competition 53; 5. (80) Ebimotors 46; 6. (83) Krohn Racing 38; 7. (86) Gulf Racing 10; 8. (54) Spirit of Race 8.